The Latin American edition of the Lemkin Seminar educates participants on policies for prevention of genocide and mass atrocities while bearing in mind the specifics of Latin American countries and their promotion of these policies internationally. It addresses the region’s current realities and the strengths of the regional system in dealing with 1) systematic human rights abuses of the past; 2) the rights of indigenous peoples; and 3) the rights of political groups. To familiarize participants with the concept of genocide, its relation to the broader category of atrocity crimes, and the processes by which genocide occurs. To empower participants with the practical competencies (knowledge and skills) necessary to develop the means to identify and deter the potential for genocide, limit genocide as it unfolds, and engage in the best practices of post-conflict peacebuilding that aim to prevent the future occurrence of atrocity crimes in a post-conflict society. To examine critically and reinforce the emergent norm of the Responsibility to Protect, recognizing that sovereignty is not a privilege but a responsibility. To foster intercultural dialogue in an open and respectful exchange between individuals with different cultural backgrounds or worldviews with the aim of developing a deeper understanding of diverse perspectives and practices, with a particular focus on the role played by discrimination and “otherness” in fostering inequality. To develop a regional network of state officials who will take action to prevent genocide and other atrocity crimes. The seminar is currently co-organized with the Auschwitz-Birkenau State Museum, United Nations Special Adviser on the Prevention of Genocide and the Responsibility to Protect and the Stanley Foundation. James Waller, Cohen Chair of Holocaust and Genocide Studies, Keene State College, U.S.
Eugenia Carbone, Director for Latin American Programs and the Technical Secretariat for the Latin American Network for the Prevention of Genocide and Mass Atrocities. Eduardo Gonzalez Cueva, Director of Truth and Memory Programs, International Center for Transitional Justice. Claudia Diaz, UN Office of the Special Adviser on the Prevention of Genocide and the Responsibility To Protect. Fabian Oddone, Deputy Head of the Argentine Embassy in Bogota, Colombia. Vahidin Omanovic, Co-Founder and Deputy Director of the Center for Peace Building, Bosnia. Andrei Serbin Pont, Investigative Coordinator for (CRIES) Regional Coordinator of Economic and Social Investigations. Piotr Setkiewicz, Historian, National Museum Auschwitz-Birkenau. James Waller, Academic Programs Director, Cohen Chair of Holocaust and Genocide Studies, Keene State College, U.S.
Davide Zaru, UN Office of the Special Adviser on the Prevention of Genocide and the Responsibility To Protect. Ramiro Gerszenswit, Secretary of the Embassy for Human Rights, Ministry of Foreign Affairs, Argentina. Natalia Luterstein, Legal Advisor in International Law for the Human Rights Secretariat, Ministry of Justice and Human Rights of the Nation, Argentina. Arely Escobar Vargas, Head of the Intercultural and equality of Opportunities Unit, Ministry of Defense, Plurinational State of Bolivia. Marlon Weichert, Regional Ommbudsman of the Republic, Public Ministry, Brasil. Mónica Fonseca Jaramillo, Director of Human Rights and International Human Rights, Ministry of Foreign Relations, Colombia. Fernando Lozano, Advisor, Directorate of Human Rights, Delegate Vice Minister of Defense before the CIAT, Ministry of Defense, Colombia. Adriana Murillo, Minister of Consulate, Permanent Mission to the United Nations, Costa Rica. Shara Duncan, Advisor to the Office of the Chancellor, Costa Rica. Analucia Quelal, Delegate of the Permanent Mission of Ecuador before the United Nations, Geneva, Switzerland. Conrado Catalan, Legal Advisor to the Vice Ministry for the Prevention of Violence and Crime, Ministry of Interior, Guatemala. Maritza O’Hara, Director of Education and Culture of Peace, Secretariat of Human Rights, Honduras. Mariana Salazar, Director of International Humanitarian Law and Legal Advisor, Secretariat of Foreign Affairs, Mexico. 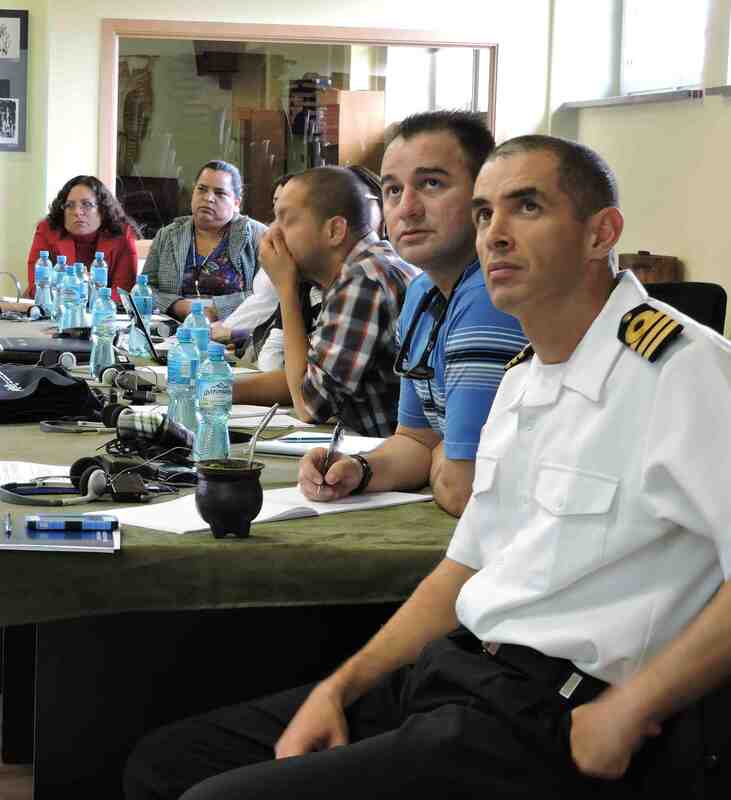 Miguel Lizarraga, Frigate Captain in the Naval Justice Service, Marine Secretariat, México. Mónica Chavarría, Head of the Regional Office of Chiriquí, Office of the Ombudsman, Panamá. Javier Mitil, Deputy Ombudsman, Office of the Ombudsman, Panamá. Juan Alberto Guzman, Directorate of Human Rights, Paraguay. Yudith Rolón, General Director in the Directorate of Truth, Justice and Reparation, Office of the Ombudsman, Paraguay. Rhadys Abreu, Director of Human Rights, Ministry of Foreign Affairs, Dominican Republic. Sandra Carolina Rivera, Deputy Attorney for the Defense of Civil and Individual Rights, Office for the Defense of Human Rights, El Salvador. Martin Orlando, Second Secretary, Uruguay Embassy in South Africa, Uruguay. Carmen Mercedes González Castro, Head of the Office for International Issues, Ministry of Interior, Justice and Peace, Venezuela. Gabriel Winter, Deputy Director of Human Rights and Humanitarian Law Directorate, Ministry of Foreign Relations, Uruguay. Eugenia Carbone, Director for Latin American Programs and Technical Secretariat for the Latin American Network for the Prevention of Genocide and Mass Atrocities. Rut Clara Diamint, Professor of International Security at la Universidad Torcuato Di Tella, Argentina. Ivan Orozco, Professor of Political Science at la Universidad de los Andes. James Waller, James Waller, Academic Programs Director, Cohen Chair of Holocaust and Genocide Studies, Keene State College, U.S.
Angela Bruce-Raeburn, Program Officer, Stanley Foundation. Savita Pawnday, Program Director, Global Centre for Responsibility to Protect. Andrei Serbin, Investigative Coordinator for (CRIES) Regional Coordinator of Economic and Social Investigations, Advisor to the Nexus Fund. Jennifer Smyser, Director of Programming Regulations, Stanley Foundation. Daniel Uribe, Coordinator in the area of Revision and Selection of Constitutional Sentencing for the Constitutional Court of Ecuador.